A screenshot from NBC 4 New York&rsquo;s recent report. 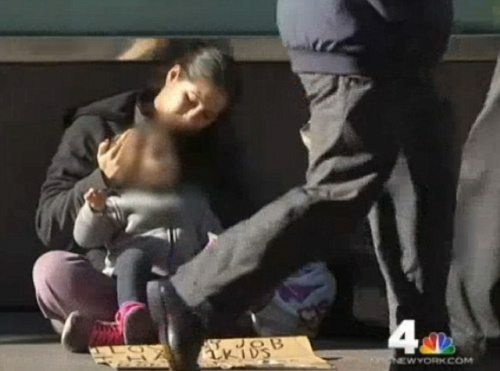 Last week, NBC reported on the increasing use of babies and children by adults panhandling in New York City. The particular group of 9 women investigated appeared to be working in tandem, and are reportedly not homeless and have repeatedly refused shelter and services. Residents of New York and other cities where this is occurring are faced with the daily decision of whether or not to give money to those who ask for it. What are the ethical implications of making contributions? “People beg for different reasons and under different circumstances, so the ethical dilemma for those who might want to give money to a child is weighing the unknown harms and benefits of their contribution,&rdquo; said Dr. Celia B. Fisher, Director of the Center for Ethics Education at Fordham University. According to Fisher and Dr. Elizabeth Yuko, bioethicist and Program Administrator at the Center, the unknown harms include the potential exploitation by parents or by adults whose relationship to the child is unknown, and possibility that the child has been trafficked for the purpose of forced begging. “In these situations [of exploitation], giving money to the child perpetuates the cycle and further enables the traffickers or those exploiting the child to continue to do so,&rdquo; Yuko explained. While that may not always be the case, and the money might provide food or other basic necessities for homeless families, there is no guarantee that the child will in any way benefit from the money. “In sum, New Yorkers need to consider whether the good feelings generated by giving money to child ‘beggars&rsquo; may blind them to the actual consequences of their actions,&rdquo; Fisher concluded.